LUCY BURDETTE: I love stories about persistence in publishing. Because most of us don't become overnight sensations. We slog in the trenches and have some happy moments along the way. 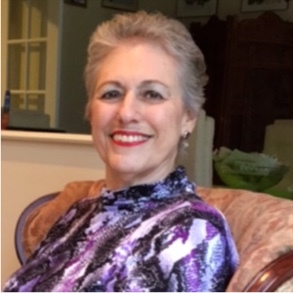 So I wanted you Reds to meet Allison Brook aka Marilyn Levinson, who has a new book out from Crooked Lane Books called DEATH OVERDUE. Welcome Allison! Like many of us, it seems that you've been on the roller coaster of publishing. First you sold a young adult book to Holt, and then you self published several mysteries, and now you have a brand-new series beginning under a new name with Crooked Lane Books. We'd love to hear about the journey! ALLISON BROOK: I started writing many, many years ago when publishing was a very different kind of business. When my two sons were small, I began writing short stories. This was the time of the typewriter and snail mail. I’d taken a few writing courses, but didn’t have the immediate support and camaraderie new writers have by joining the Guppies chapter of Sisters in Crime. I took a course with an author named Roberta Gellis. Roberta became my mentor and dear friend. She helped me birth my first few novels. I acquired an agent and sold the third book I’d written –AND DON’T BRING JEREMY. This juvenile novel was a nominee for six state awards. I thought this meant that I’d arrived and I’d have no trouble selling my books. Only this didn’t happen. I sold a few more novels for kids. RUFUS AND MAGIC RUN AMOK—about a boy that discovers he’s a witch that I wrote before Harry Potter came out—was a Children’s Choice. I decided to change genres and to try my hand at writing romantic suspense and mysteries. I began selling to small presses, many of which publish ebooks. I had both good and bad experiences, and found it necessary to self-publish a few of my books. Most recently, my new agent shopped around DEATH OVERDUE, the first in my new series, and Crooked Lane Books gave me a two-book deal. LUCY: Your main character in this new cozy mystery series is a librarian. Have you worked as a librarian in a past life? If not tell us how you came up with her. ALLISON: I’ve never been a librarian, but I spend a good deal of time in my library, attending programs and checking out books and movies. I’ve gotten to know many of the people who work in my library. I’m familiar with their specific job requirements, which was most helpful when I started writing DEATH OVERDUE, the first book in my Haunted Library mystery series. A few summers ago, I was attending a one-man drumming program in our library’s beautiful park. Lauren, our Head of Community Services, had introduced him. As I listened to the drummer, it occurred to me that having a sleuth in charge of programs and events would give her many opportunities to meet people in different walks of life. The library itself is like a small village within a village. LUCY: How do you like working with a small press that features mysteries? ALLISON: I love it! I have the best editor, someone I knew before, and absolutely love the cover of DEATH OVERDUE. More important, readers love it! Because of the wonderful exposure CLB has given my book, Blackstone has make an audio of the book; I’ve received a starred review and Pick of the Month from Library Journal; received a nice review from Publishers Weekly; have had my book with Net Galley, which led to many wonderful reviews on Goodreads, resulting in the book being #111 of the 200 most popular books published in October, 2017, and DEATH OVERDUE being a Mystery/Literary Guild book club selection. I could never have gotten this exposure on my own. LUCY: Will you share some tips for writers who are hoping to get published in these times? ALLISON: There are many, many books being published these days, and you want to make your book stand out as best you can. First of all, learn the elements that go into a good novel. This takes time. Join writing groups like Sisters in Crime. Take classes, either in person or online. Join a critique group that’s familiar with the type of book you write. You want to belong to a group that provides support and helpful criticism. Read in your genre. Keep on writing. Writing is a process. It can’t be rushed. Be aware of marketing, what is wanted in your genre, while nurturing your own style and voice. So much of this sounds contradictory, but this, too, is part of the process: to believe in yourself while keeping an open mind to those critiquing your work. If you were planning to write a cozy mystery series, which occupation would you select for your amateur sleuth? Any other questions for Allison? A former Spanish teacher, Allison Brook aka Marilyn Levinson, writes mysteries, romantic suspense, and novels for young readers. She loves traveling, reading, knitting, doing Sudoku, and visiting with her grandchildren, Olivia and Jack, on FaceTime. She lives on Long Island with Sammy, her feisty red cat. This is her first Haunted Library mystery. You can find her on Facebook, Twitter, and her website. ABOUT DEATH OVERDUE: Carrie Singleton, forgoes her purple hair and Goth attire to become Head of Programs and Events at the Clover Ridge Library. She finds herself embroiled in solving a cold case and a new murder with the occasional help of the library’s sixty-something ghost amid family squabbles, romance and discovering her place in life. Congratulations, Allison, on your new book . . . I’m looking forward to reading it. If I were planning to write a cozy mystery series, I think I’d have my amateur sleuth be a taxi driver or perhaps an Uber driver. So many different people to meet and places to go . . . or maybe [for the same reasons] I’d have her be the stay-at-home neighborhood busybody . . . . I agree! Lots of places to find dead bodies. Best of luck with Death Overdue. What a delightful sounding read. Can't wait to delve into the juxtaposition of Carrie and a sixty-something ghost! What fun. Thanks so much, Kait. I'm having a lot of fun writing this series. Welcome to Jungle Reds, Allison Brook! By coincidence, I have a copy of DEATH OVERDUE on the table as I am typing this. I thought the book was perfect read for Halloween! I love libraries. My local library has an interesting set up. The library shares a building with the community center. The library and the community center are all on one floor and it is a one floor building with a few rooms in the basement. It means the library and community center are wheelchair accessible, which is great. I would love to read your children's book about a boy who is a witch. Thank you for sharing your tips. I took writing classes with Book Passage Mystery writing conference. The guppies sound like a great idea and I am going to try that. I'm delighted to be here in such good company! I love libraries and thought that would make a perfect setting for a cozy series. I suppose I'm drawn to including the occasional witch or ghost in some of my books. RUFUS AND MAGIC RUN AMOK, which was a Children's Book Council's "Children's Choice" is about a boy who discovers he's a witch and tries to hide it from his family because he knows they'll make him take lessons to control his power. As for the Guppies—well they're the best group for a new mystery writer to join. Most writers never leave the group. I thought this post was not published because my wifi connection broke off! Lucy and Marilyn, thank you! SO thrilled with this! And so delighted you have such great news---you know I am a big fan. Congratulations. ANd I've hear wonderful things about Crooked Lane! Hmmm..what cozy main character? I always wanted to write a home inspector. You know? The people who look for termite s and asbestos and bad pipes--and get to see everything and go everywhere. Editors, are you hearing me? Yes Hank, I'm sure they're listening LOL. But you would have to learn a little about all that stuff, right? You could pick Nick Petrie's brain, Hank! He had his own home building and inspection company for fifteen years before "The Drifter" came out! Ingrid, it was lovely meeting you in the book room. I met Nick Petrie at Bouchercon. He and his wife were in the cafe when Sara Paretsky and Nick were in line behind me! I have your Brutality book and Nick's the Drifter book. Hank, You could do an undercover story about home improvement people who rip off the public. And your inspector is a hero—or heroine, as the case may be. I've just come back from Physical Therapy. I'm forced to lie still for 10 minutes at the beginning when I get heat, then 10 minutes after my massage (Yes, that's right!) and I'm iced. I managed to work out a new setting for a new series. Oh, Lucy, la dee dah. That's why they call it research. ANd yes, Ingrid, a great excuse to hang out with the fabulous Nick! And so funny, Marilyn--I did that in real life! Thanks so much, Mary! DEATH OVERDUE is getting quite a bit of attention. Congratulations on the two-book deal with Crooked Lane Press, Allison. It's inspiring to see where following your heart has led you! And you write in different genres--what kind of romantic suspense do you write? (I grew up reading Mary Stewart, Madelyn Brent, Victoria Holt, Phyllis Whitney, etc.). A series character? I'm a big Miss Marple/Mrs. Pollifax fan, so I'd go with a retired trauma nurse, who now volunteers as a hospital docent--she'd have a wide range of contacts, and being a (retired) nurse, she'd be trained to notice details, to put two and two together--to react quickly, and to care deeply about people. I've one romantic suspense out—DANGEROUS RELATIONS— about a lawyer who wants to adopt her cousin's daughter after her cousin's been murdered, and finds herself going up against a man she's falling for. Cousin Suziette was rather promiscuous, so there's a slew of possible killers. I LOVE Miss Marple and enjoyed reading the Mrs. Pollifax series. I swear sometimes I think the Jungle Reds blog reads my mind, as this has happened more than once. 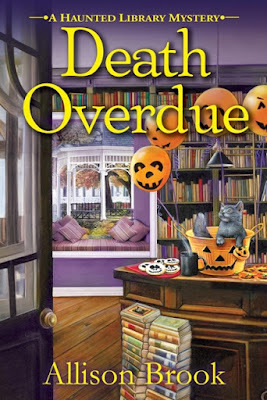 I had just seen Death Overdue on Dru's Musings (our wonderful Dru Ann Love)and commented to Dru how much I loved the cover of this book and the whole premise for it. So, Allison, I am delighted to see you here this morning. I will be reading the book for sure. And, I have always loved the name of your new publishing company, Crooked Lane. It just speaks of interesting findings along the way. Now, back to reality and waiting for the estimator from the plumbing company to tell me how much it's going to cost to replace all the galvanized pipes under the house. Sorry about your plumbing problem, Kathy. I'm delighted to be here this morning. Crooked Lane is a wonderful pub house. They're very supportive of their authors. I, too, love the cover! So many readers have commented about it. At first I was concerned because this isn't a Halloween book, though DEATH OVERDUE takes place in October and there is a Halloween Party at the library. I think their decision was a good one. And they were sure to include Smoky Joe, the library cat in a Jack o'Lantern dish. Congratulations, Allison! This is wonderful. As a former librarian who was in charge of programming, I am delighted to see your new series hitting the shelves and getting such fabulous recognition! Well done! Thanks so much, Jenn! The idea for my sleuth came while I was attending an event at my library. I was watching Lauren, the head of our adult services, introduce the drummer. (This was outdoors at our wonderful parklike setting) Of course, Carrie is nothing like Lauren. Thank you so much for having me at your wonderful Jungle Red blog today. Now I'm off for a few hours of Physical Therapy, but promise to return to answer more questions. Amateur sleuth character? How about a bicycle riding professional writer? Living in St. Mary Mead? With a waxed mustache? Can you see why I read and don't write? It might prove to be an interesting set up. I love the idea of a haunted library. I've worked in a few that certainly suggested that possibility.Good luck with it! And the ups and downs of publishing? No easy answers-we could all add war stories - but your advice was right on target. Thanks so much Triss. Everything about this book went smoothly. (Except that they left out the Dedication in the hardcover, and I'd dedicated the book to my oncologist who healed me. ) Over the years I've paid my dues, which doesn't mean there aren't more bumps awaiting me in the future. Congratulations, Alison. Your book looks great! Two careers that I have actually noodled with using for a cozy are church choir director and something in the life coach/personal trainer/therapist vein. The church choir director because I've been a church choir singer my whole life and I know how much choir members and even other parishioners open up to a good choir director, leaving her/him with a lot of knowledge about what's going on in people's lives. And the less-well-defined other choice because in any of those careers, you spend your time hearing intimate thoughts from a wide array of people. And even though that professional can't betray a direct confidence, it seems like he or she would be in a position to put pieces together and see the whole better than the players in a specific situation. Thanks, Susan. Your ideas for future series are great. I like the church choir director one because it makes me think of Sidney, that gorgeous hunk in the Grantchester series on TV. And you could also write about music. Well, in my Golden Age of Mystery Book Club series, my sleuth refers to mysteries written by the Golden Age author of each book. It was fun rereading mysteries by Dame Agatha and Josephine Tey. I love the idea of a comedic series, Jim. And the sleuth always getting it wrong until he or she does solve the case. Congratulations, Allison! Thanks so much for sharing your publishing story with us. Do you think you'll write children's books again? Do you prefer writing one genre compared to another? I know I've one more Rufus book to write. The second one, RUFUS AND THE WITCH'S SLAVE, was supposed to come out 2 years ago, but the pub house went out of business. I plan to write the third book, because I see the books as a trilogy. Right now I'm happy to write mysteries. Allison, congratulations! Sounds like a perfect book for Halloween. I think it's only the rare individual that does NOT have a hard slog getting published... and we hate them. My amateur sleuth? NOT a writer. Yes, we do hate them secretly, Hallie. Rhys, that would be awesome! I would love to read that. Me, too. Because it would have your Rhys stamp on the main character. I have to add my vote, Rhys! That definitely sounds like a book I'd enjoy!!!! Congrats on the new book! Sounds like this series is off to a great start. Thanks, Mark. I've been hearing from a lot of readers who have already read the book and tell me the loved it. It's wonderful to hear. Of course, I hope they'll love the next in the series, too. Oh, Roberta Gellis! So sad that she's gone. I started reading her novels in the early 80's when I had small children and really needed the occasional getaway. She provided that with her great characters and wonderful stories. I'm sure she was a wonderful influence and support. One of my favorite things about her books was her attention to detail and to the facts. I never caught her in a historical error and that is something I greatly admire. Now I'll have to try your books. Congratulations on hanging in there and getting published when it was really hard! Thanks, Beverly. I loved Roberta! She was like a relative to me. She was well known for her historical accuracy. Aside from that, I was constantly amazed at how much she knew about so many things. And if she didn't know, she said so. I miss her. Allison, this is the third time I have tried to comment here. Ok let's see if I can get my comments published before the wifi breaks again! Allison, welcome to Jungle Reds! Congratulations on your new series! By coincidence, I found your book in the bookstore before I left for Bouchercon so I bought a copy. I thought it was the perfect read for Halloween. I like to celebrate Halloween by reading Royal Blood by Rhys Bowen, one of the Harry Potter books, and other books with witches and spooky characters. Though I have taken writing classes at Book Passage Mystery Writing conference, which I highly recommend, the Guppies sound like a great idea and I am going to try that. I need to renew my membership with Sisters In Crime chapter. Good books are worth the wait. The Guppies are a wonderful support group. And they have subgroups, too. For example, if you want a critique partner, you can be matched up with someone. There's a subgroup for marketing, for submitting to agents, I believe. And they offer on-line classes as well. Marilyn, that's wonderful! Thank you. Welcome Allison/Marilyn. I so enjoy reading the librarian as amateur sleuth novel. After all, librarians are trained to be investigators.. who better? well.. I did think about a travel agent or call center travel rep / these folks sort of become quasi therapists sometimes.. I can see the agent flying into an exotic locale to help solve a crime. Guppies sounds like a marvelous group, glad it is out there for the soon to be published. A travel agent sleuth is a great idea. You could go to a different country for each book and, I imagine, get a tax break on your "research." Hi Allison/Marilyn, and congratulations on your new series! It does sound like the perfect read for Halloween. And kudos for your persistence--it's very inspiring. Amateur sleuth, hmm.... I'm sure someone has written a real estate agent, but my daughter is a realtor and she sees all sorts of things!! An English estate agent would be fun, but I'd have to learn how the business works--it's quite different from the U.S. and very confusing to me. Thanks so much, Deborah! There are amateur sleuths doing so many conceivable jobs. Amazing how we keep on coming up with more ideas! Marilyn/Allison: great post. Thanks for sharing about your writing/publishing experiences. And I wish you continued success with Death Overdue.